Unzip and unearth: Discover the possibilities of a hand stitched zipper bag and unearthing roof problems. 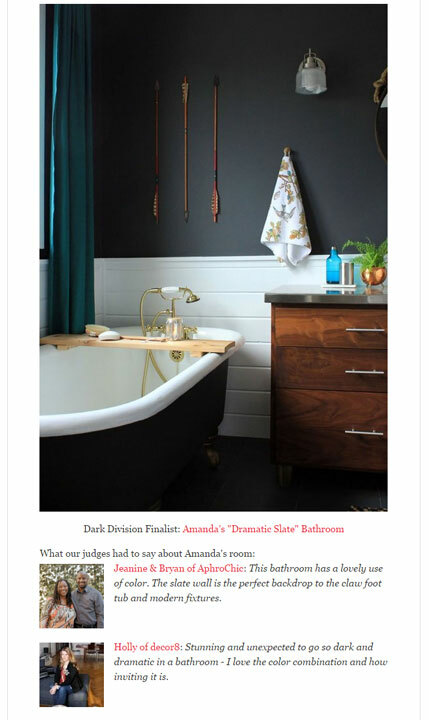 Never ending: Bathroom projects; mood board planning, industrial pendants, and painting the vanity bold blue. Enjoy the upgrades: A new vacuum, more sun filled spaces thanks to cutting down a tree, a semi clean basement, and the beginnings of an entertainment center. I fully intended to watch fireworks from our living room. As it got darker, I became more excited. Afterall, this is the first 4th in our mountain house. At 10:30, I saw fireworks from the neighboring town. 10:30 rolled past and still no fireworks for us. At 11:00, I laid in bed because a watched firework never starts. And that’s where I made my mistake. I laid in bed, waiting to hear the fireworks. Then, I’d get up, watch, and maybe take a few pictures. Well, I fell asleep before I heard the fireworks start and must have slept through. Completely lame. How was your 4th of July? Did you stay up to watch fireworks? Have friends and family over?